Making an exclusive "build-a-figure" that's only available by purchasing several others is a marketing tactic that toy collectors often have to endure. 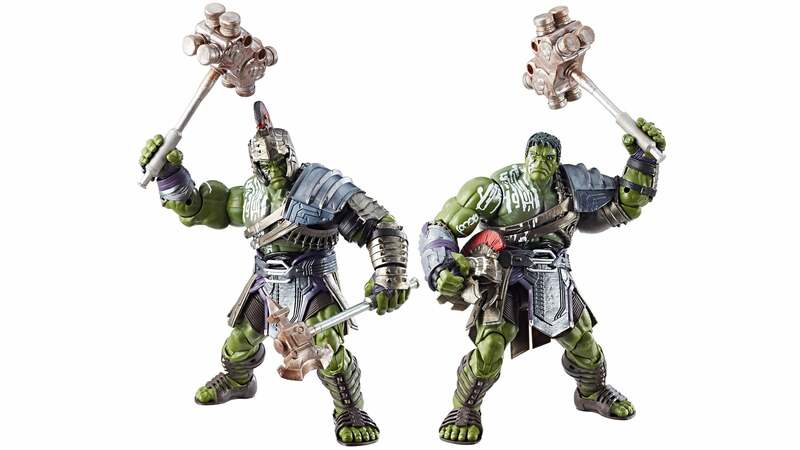 But after watching the first spectacular trailer for Thor: Ragnarok, we want every figure in Hasbro's new Marvel Legends Series six-inch line, including the giant Gladiator Hulk build-a-figure. The line-up includes individual six-inch figures for Loki, Thor, and Hela, complete with her spectacular headdress, for $20 (£15) each. There will also be a Target-exclusive Thor and Valkyrie two-pack available for $40 (£30), which includes a variant Thor head without the helmet and face paint, and a massive sword that's almost as tall as Valkyrie is. These new additions to the Marvel Legends Series line join three Thor: Ragnarok six-inch figures already revealed a few weeks ago, including Jane Foster's Thor, Odinson, and Ares. They're all fantastically detailed with plenty of articulation, but the best accessories they each come with are parts of the Hulk in all his gladiatorial gory. In the end you'll have to spend over $120 (£91) on Thor: Ragnarok figures to assemble Gladiator Hulk, but look at that helmet! That armour! That giant hammer! And no Marvel character has ever rocked gladiator sandals better than the Hulk has, either. These figures will be available this fall, prior to the release of Thor: Ragnarok on November 3.